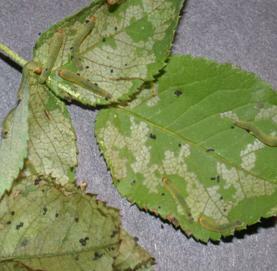 Sawfly larvae and their feeding damage on a rose leaf. The roseslug sawfly (Endelomyia aethiops) is an insect native to Europe that often causes damage on leaves of wild and cultivated roses in May and June. Appearance: Roseslug sawfly adults are fly-like insects with two pairs of wings. Larvae are yellow-green caterpillar-like insects with an orange head. The larvae grow up to ¾ inches in length. 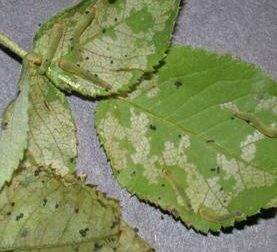 Symptoms and Effects: Roseslug sawfly larvae feed on the soft tissue of rose leaves leaving the harder tissue (e.g., veins) intact, a feeding pattern called skeletonization. Damage typically first appears in early to mid-May and can continue through mid-June (or possibly slightly later in northern parts of Wisconsin). Leaves eventually brown and dry. Damage caused by roseslug sawfly larvae is cosmetic and will not have serious long-term affects on rose plants. However, the damage can severely reduce the aesthetic value of the shrubs. Life Cycle: There is only one generation of roseslug sawfly per year. Adults emerge in early spring and lay eggs on leaves. Eggs hatch and larvae emerge in late April to early May. Larvae crawl to the ground to spin cocoons by mid June. Control: Early detection of roseslug sawfly larvae is important, and allows a wider range of control options. If an infestation is small, larvae can be removed by hand. If the infestation is large, insecticidal soaps or an insecticide that contains permethrin, acephate, carbaryl, cyfluthrin, bifentrhin, or malathion can be used. Check the undersides of leaves by mid-May to decide if treatment is needed. Make sure products are applied while larvae are still present and before feeding damage is extensive. Read and follow all label instructions of the insecticide that you select to ensure that the product is used in the safest and most effective manner possible.